Test 9 is today, at the beginning of the timeslot, and will run approximately 14 minutes. It’s time to work with non-text media types. Our web apps must capture, store, and deliver these content types. Today, we’ll cover the concepts and techniques for handling a simple scenario where an entity class (Product, Player, Vehicle, Album, etc.) includes a single photo. Then, before the Friday or Monday class, we’ll post another notes document and code example that covers the concepts and techniques for handling a more complex scenario, where an entity class is associated with a collection of non-text media items. Notice that the photo is defined by the HTML <img> element. The <img> element has two attributes that must be included, alt, and src. The value of the src attribute must be a path – absolute, or relative to the current document – to the photo. In other words, the value of the src attribute is a URL. In an <img> element, the value of the src attribute is a URL. How does a browser fetch and render the example document from above? 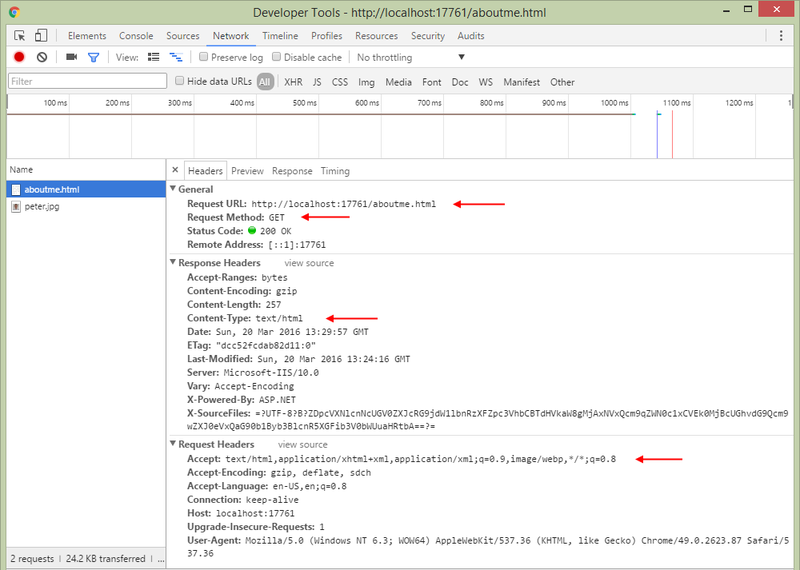 To see how, and learn the details, use the browser developer tools. 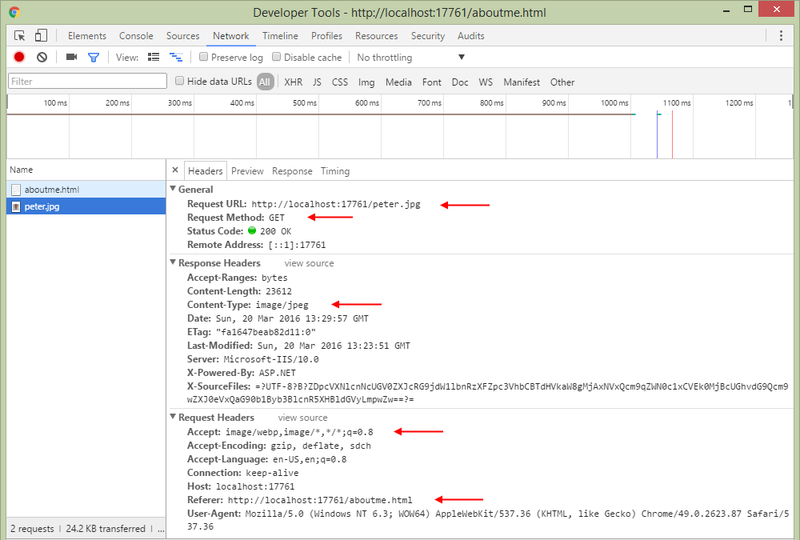 For example, in Chrome, open the developer tools, and select the Network item. Then, request the document. This is what you’ll see. Click the image to open it full-size in a new tab/window. This is how it works. Always. When the browser fetches an HTML document, it parses the content. When it finds an HTML <img> element, it sends another request, to the URL value of the src attribute. Click the image to open it full-size in a new tab/window. The terminology used to identify, define, and categorize web content is a bit sloppy. Yes, there are terms that are very precise, but often they are used in an imprecise manner. That’s the sloppy part. Here, we will attempt to be precise, but we will still need to be flexible sometimes. The example above worked with two kinds of web content, text, and a photo. Each kind of web content is defined by its media type. In its strict definition, every kind of content – text and non-text – has a media type. For example, an HTML document’s media type is text/html. As you know, we can work with many kinds of non-text content, including audio, video, digital documents (e.g. PDF), etc. In general, on the web, each non-text content item is defined as a media item. While each media item can be completely defined by its media type (in its Content-Type header), web developers can also use an application of media types, known as MIME. Among other capabilities, the MIME standard describes how to deliver/render/present a media item. We often see this on pages that offer a PDF document: Sometimes, clicking the link to a PDF document will display the document in the browser. Alternatively, sometimes the PDF document will be downloaded (with or without a pop-up dialog that enables the user to continue and/or save to a specific location on their device). This behaviour is influenced by the web developer, by using the Content-Disposition header. We noted above that the “Accept” header, in a request, indicates the acceptable content types. More formally defined in RFC 7231, it is used to “specify response media types that are acceptable” to the requestor. All browsers – Chrome, Firefox, Safari, Edge – are configured with default settings for their Accept header. This MDN article attempts to document these defaults. Yes, it is possible to edit the defaults. This article does a pretty good job of explaining the situation in modern browsers, with commentary on issues and problems. If an HTML document includes a media item, the browser creates a separate request for that media item. Therefore, whatever solution we create, it must expose the media item as a URL. Note: Some students may have seen or used a “data URI”. The Data URI scheme provides a way to include the media item’s encoded data as the value for the “src” attribute. We will not be covering this topic, as it is beyond the scope of this course. You can learn more on your own by reading the RFC, this MDN article, or this Wikipedia article. In the past, you have written web pages and web apps that have used static media items. Each media item could then be referenced by a URL, using an absolute or relative path from the document that includes the (for example) HTML <img> element. The ASP.NET MVC Routing system does not do any processing of requests for static resources. These requests are handled by the underlying web server (and not passed on to the ASP.NET MVC runtime). Is this the only way to handle media items? We can also dynamically handle a media item. In an ASP.NET MVC web app, what this means is that the URL to the media item would be handled by an action/method in a controller. Why would we do this? For many reasons, including design, user experience, security, scale, flexibility, and others. In other words, we want to actively manage the way that media items are handled. So, from above, you learned that you can use a static or dynamic approach for media items. A related issue is the storage of media items: Where should the media item be stored? File system: Media items are in the file system, within the URL namespace of the web app. Persistent store (i.e. database): Media items are in the persistent store (i.e. the database). The media item can be an embedded property of another entity class, or it can be defined in its own dedicated entity class. Hybrid combination: A media item is in the file system, but its metadata is in the persistent store. Similar to above, the media item’s metadata can be in embedded properties of another entity class, or it can be defined in its own dedicated entity class. Note: If/when the web app is hosted in the cloud (e.g. Azure), the cloud service may offer additional ways to store media items. Learn the foundations in today’s notes and code examples, and then you’ll be able to adapt to other approaches as needed. The following introduces some implications for static and dynamic handling of media items, and their storage. In a web app that uses the file system to store media items, it must have a folder to hold the media items, maybe called “images”, or “assets”, or something that fits with the web app’s problem domain. In an ASP.NET MVC web app, you may be tempted to use an existing folder, but resist that temptation. You cannot use App_Data, because its contents are not publicly accessible. You should not use Content, because that has a specific use now, and may evolve in the future. Therefore, create another folder. Using a static delivery approach, the file name extension of the media item is super important. The web server (that is hosting your web app) will use the extension to set the Content-Type header in the response. File names (for the media items) are important. Their length must be reasonable. They must be unique. To simplify coding and handling, the character set used for the file names should be neutral, especially for a web app that’s used worldwide. Also, about the file names, should they be semantic? That’s a big area of discussion and controversy. Using this file system storage approach, each media item is logically associated with an entity object in your problem domain. How do you maintain that association? Carefully. And separately. It is likely that the media item itself cannot store information about the association, and the file name may not be enough do do the job. Therefore, the entity object must include a property to hold the media item’s file name. How should a file system based media item be delivered to a browser user? Statically, using a URL that maps to its file system location and file name? Or through some other dynamic and managed approach? Beyond file names, extension names, and created/modified dates, the file system will not (and cannot) support metadata querying. For example, it will become difficult (and non-performant) to handle a query, for example, for all photos larger than 1000px wide and 800px tall, for example. It also may be difficult or impossible to store descriptive metadata in the media item (depending upon its format). Finally, in a web app that uses both a persistent store (i.e. database) and the file system for data storage, the web app manager now must manage two separate storage locations, and ensure they’re backed up and secure. In a database-hosted data store, the media item’s data is stored in a byte array (the C# type is Byte). This data type maps nicely to both the storage and delivery components involved. As a result, it’s on equal footing with the file system in this respect. You MUST store the media item’s media type string. During the file upload task (as you’ll learn below), that metadata is available in the Content-Type of the request. Delivery of the media item is managed by your app. Usually, a special-purpose controller accepts an identifier in the request URL, then locates the requested media item, and finally delivers it to the requestor. Backing up the web app’s data is simple, because there’s a single location for all the app’s data – the persistent store. A frequent and notable criticism of this approach is that a media item is transformed when stored, then again when retrieved, from the data store. For large media items, this work can be considerable, and may hurt performance. Acknowledged. It is also possible to combine both techniques. In this approach, your app stores the media item’s data in the file system, and metadata in the data store. The file system location can be a folder in the web app’s URL namespace. Often, the file name is a GUID, or an adaptation of a GUID. The data store class includes media item metadata, including (most importantly) the file name. Similar to above, a special-purpose controller is used to help locate and deliver the requested media item. This approach is often used in situations where the media item size is large (multi-MB or multi-GB), or where there’s a large number (e.g. millions) of media items to manage. As you would suspect, today’s best-known and widely-used web apps use this approach. Name any of them, they do it: YouTube, Facebook, Netflix, etc. Beyond that, other properties – metadata – can be added, if desired. In a class, a media item needs two properties: A byte array for the data, and a string for the media type. If the design of an entity class is intended to hold one single, distinct, and unique media item, then it’s acceptable to simply add these properties to the entity class. For example, if an Employee class will hold one – and only one ever – photo for the employee’s photo identification card, then the Employee class will include these two properties. If an entity object logically needs a collection of media items (e.g. a photo gallery for a Product object), then create a separate entity class for the media item, and then configure the to-one and to-many (or whatever) associations needed to meet the needs of the problem domain. Finally, if the primary purpose of the app is to manage media items (like YouTube, for example), then the entity class(es) must be designed around the needs of the app, and the media item entity classes become the central part of the design model. This topic is beyond the scope of this course. Based on your past experience, you already know how to statically store and deliver media items. (A media item is located in your web app, and it can be accessed by a URL.) If you have ever used the HTML <input type=file> element, then you know how to capture (i.e. upload) a media item; this task requires server-side logic to save the media item in the file system. If you have not ever done this, then you will learn how capture works below, and can adapt it. We will build a dynamic solution to capture, store, and deliver media items. Media items will be in the persistent store (i.e. database). Open the PhotoProperty code example, and study it as you continue reading the next sections. If you want to use the code example, there are some extra photos in the project’s App_Data folder that you can choose/select. 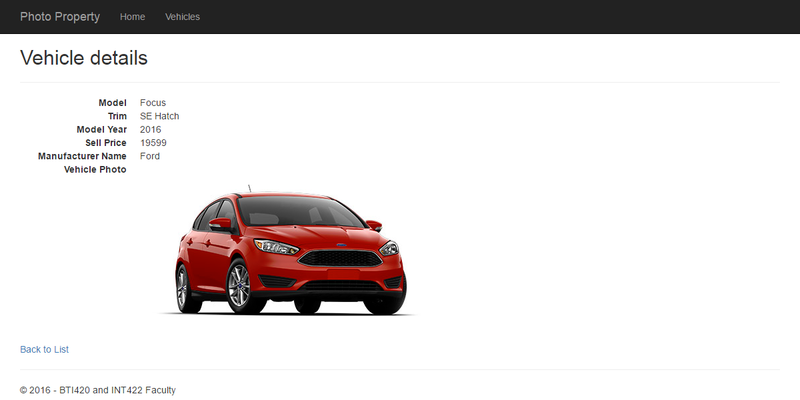 If you want accurate model, trim, and price data, it’s on the ford.ca web site. We return to the familiar vehicle / manufacturer problem domain. We will have only a Vehicle class. Let’s start with the VehicleAddForm view model class that is used to build an object for the HTML Form. It will have the expected properties. It has a PhotoUpload property, of type string. It will also use a DataType data annotation, to identify it as a file upload property. Normally, when you ask the scaffolder to build a “create” view for a string property that uses DataType.Upload, the scaffolder will NOT generate the code in the view. You would have to add it yourself. To save a bit of work, the code example includes an editor template, which is a feature of ASP.NET MVC. In Solution Explorer, look in the Views > Shared folder, and you will see a partial view, Upload.cshtml. Its code will be automatically used by the scaffolder to generate the code for a DataType.Upload string property. Next, look at the VehicleAdd view model class, which describes the data submitted by the browser user. It also has a PhotoUpload property, but its type is HttpPostedFileBase. As noted in the MSDN documentation, it is “the base class … that provide access to individual files that have been uploaded by a client”. Before continuing, check that the AutoMapper “create map” statements have been defined. Next, let’s work with the controller. The good news is that the configuration of the two “add new” methods (GET and POST) is similar to almost every other “add new” use case. Next, the view. Use the scaffolder to generate the Create view. Then edit it, to clean up its title etc. The Manager class is the next place to get some attention. Its “add new” method will look similar to all others that you’ve coded, but it will have more statements to handle the uploaded media item. Notice that the view model class properties for PhotoUpload have the [Required] attribute. Therefore, if the code in the manager method is running, you can be assured that it has a PhotoUpload object, and therefore you don’t have to test for null etc. A few notes about the Manager class “get…” methods, and the “…Base” class. The manager methods look the same as other methods that you have written. And, as noted earlier, the “…Base” class does NOT (and must not) include properties for the media item. Therefore, we are not leaking – unintentionally or otherwise – media item data to the controllers and views. We continue to work with relatively small-sized objects in memory. At this point in time in the solution, we have a way to save a media item into the persistent store (i.e. database). How do we get it out, to deliver it to a browser user? In our dynamic approach, we will use a special-purpose controller to deliver a media item. 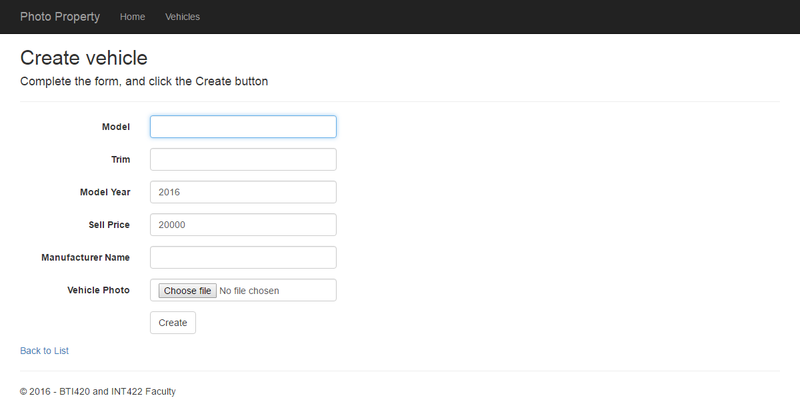 It will use attribute routing to shape the URL segment. The result will be that the media item is available to the browser user at a specific URL. Above, you learned that the “…Base” class does not include media item properties. Here, we need them. In the code example, a Photo controller was created. Its singular purpose will be to host a “get one” method that accepts an identifier for a media item, and then deliver it. The code will look like the following. Notice that it is NOT returning a view ActionResult. Instead, it is returning a file ActionResult. The File() constructor arguments will cause the request-handling pipeline to construct a correct response. Yes, it is as simple as that. This week, your teacher team plans to post another notes document and code example that covers the concepts and techniques for handling a more complex scenario, where an entity class is associated with a collection of non-text media items.